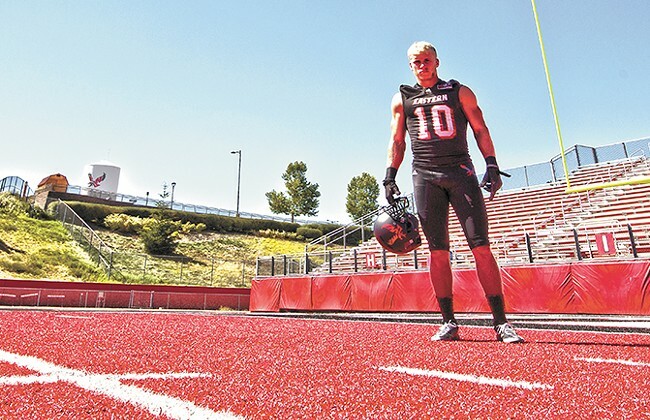 Two-time All-American Cooper Kupp stands on his home turf at "The Inferno." Led by two-time All-American and record-setting receiver Cooper Kupp, the seventh-ranked Eastern Washington University Eagles (2-2, 1-0 Big Sky Conference) host the Cal Poly Mustangs (2-3, 1-1 Big Sky Conference) Saturday at 1:05 pm at Roos Field in Cheney. With intriguing similarity to the unlikely Rice/Totten super-duo, Kupp's quest for immortality has been aided by the strong play of former walk-on quarterback Jordan West, who passed for 526 yards against Northern Iowa on Sept. 12 and 491 yards in a victory against Sacramento State on Sept 26. As a matter of fact, the performances of Kupp and West in 2015 are why the Eagles have the No. 1 passing offense in the FCS (466.3 yard per game). That being said, the Cal Poly Mustangs have some offensive firepower of their own. Despite starting their season against five opponents that have been nationally ranked at some point this season, the Mustangs have ridden their triple-option offense to become the top-ranked rushing offense in the FCS (363.8 yards per game). Cal Poly's offense is led by well-rounded quarterback Chris Brown, who is seventh in the FCS with 529 rushing yards in five games, along with 342 passing yards and 12 total touchdowns. Mustangs head coach Tim Walsh and his dangerous offense will look to exploit Eastern's run defense, which is 122 out of 123 FCS teams, allowing 313.0 rushing yards per game. Although they are 2-3 on the season, Cal Poly has played relatively well in 2015, opening their season with a victory on the road against then 12th-ranked Montana. With the top rushing offense in the FCS pitted against the top passing offense, this important Big Sky Conference game is set up to be an offensive shootout. The Eagles will be looking to improve to a winning record and keep marching towards a fourth straight Big Sky Conference championship, while the Mustangs will try to avoid dropping to 2-4 on the season. If you can't make it out to Cheney on Saturday, the game will likely be televised at The Swinging Doors in Spokane and you can check EWU Football social media accounts on Friday for more information on where to view the game. Following the contest, remember to keep an eye out for the post-game wrap up, right here on The Bloglander.